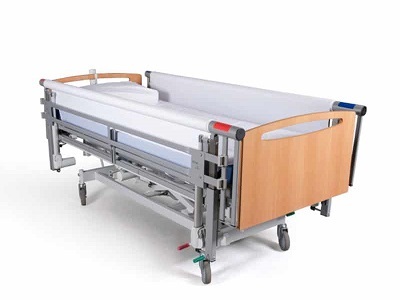 For reasons of safety, HLS Healthcare has always recommended that bedridden patients should not operate the VENDLET system on their own. However, the newest model of their electrical turning system, the VENDLET V5S allows patients with sufficient cognitive abilities and physical strength to operate the controls themselves. However, it is important to conduct a risk assessment of the individual client before they are allowed to operate the VENDLET V5S system on their own. This assessment will evaluate whether the client has the ability to understand the system and if they can comprehend the consequences of pressing the buttons on the hand control. In addition to cognitive abilities, the client must naturally also have the physical strength to operate the hand control. If the client has sufficient cognitive and physical abilities, they can get a feeling of satisfaction and independence from being able to operate the system themselves. This would also allow them greater physical comfort. The VENDLET V5S is ideal for rehabilitation therapy sessions where the client can participate in the moving and repositioning processes even if they do not have sufficient abilities to operate the electrical turning system independently. For instance, if the client is capable of operating the hand control, the therapist or caregiver can guide the client’s arms or legs during the transfer, thereby helping with the rehabilitation process. If the client has the physical resources to contribute to the transfer, this can also be further supplemented with manual repositioning aids that reduce friction such as handles or grips, both available in the Vendlet MANULET series. At some institutions, the VENDLET system is only used for clients that are completely immobile and manual aids are preferred for clients that still have some resources. This can have negative consequences for the healthcare staff, given that physical strain on the neck, shoulders and back is higher than recommended when using manual moving and handling aids. To ensure a good work environment in such settings, it is important to use mechanic aids whenever possible. The system is also recommended for clients who are more mobile and have some resources. Always remember, the client’s functional levels can vary during the day. Therefore, it may be necessary to use some aids during the daytime and others at night.